Gudrun is much more than a career yogini. She is a master martial artist, shiatsu massage practitioner, yoga and pilates instructor, and a fabulous chef. She has spent decades learning the secrets of Tai Chi, Chi Gong, and Ayurveda. 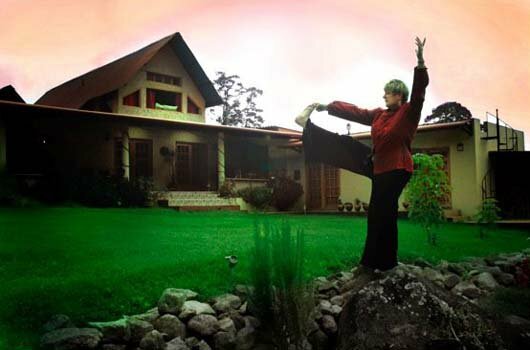 She founded the 5 Elements School for yoga and martial arts in Montreal, Canada, and has recently opened a healing retreat center in Cerro Punta, Panama. Gudrun is loved by thousands of students, many of whom have followed her from Canada to Panama. In and out of her studio, she is a fountain of knowledge for all those around her. She is a dynamic teacher that never ceases to inspire. Among Gudrun’s best and most dedicated students is her daughter, Katherine, who has taken over the management of the 5 Elements School. Gudrun’s hobbies include cooking, gardening, and the art of bonzai. You can contact her by e-mailing gudrun@yoguini.com by visiting the Web site of her retreat center, www.orilladelrio.com or by calling either +507 6798-7508 (Panama) or +1 514-634-1294 (Canada/USA). This entry was posted in yoguinis by Michael Ducharme. Bookmark the permalink. I am interested in the yoga clssaes for heavier people. I have never done yoga, and my flexibility is not where it should be. I am very interested in taking the beginner lessons to help with this issue and relaxation. When and where are these clssaes available? Thank you.